iFunia PDF Image Extract for Mac is a Mac image extractor that can be used for extraction of the raster images from single or multiple PDF files, and saving them to a disk, or converting them to numerous graphic formats including JPG, PNG, GIF, TIFF and BMP. 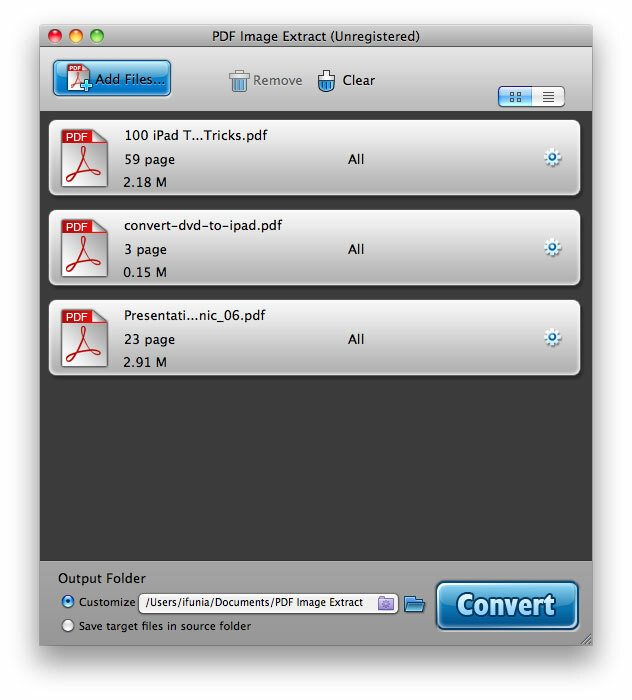 Mac PDF to image conversion became an easy two-step process with PDF Image Extract. Just select your file and choose the format options then convert. ...... Just select your file and choose the format options then convert. * Run it well on Snow Leopard. Qweas is providing links to iFunia PDF Image Extract for Mac 2.0.0 as a courtesy, and makes no representations regarding iFunia PDF Image Extract for Mac or any other applications or any information related thereto. Any questions, complaints or claims regarding this application iFunia PDF Image Extract for Mac 2.0.0 must be directed to the appropriate software vendor. You may click the publisher link of iFunia PDF Image Extract for Mac on the top of this page to get more details about the vendor.